In the NHL their are household names like, Alex Ovechkin, Sidney Crosby, Roberto Luongo, Pavel Datsyuk, and Tim Thomas. People all around the NHL will know these names no matter what team they root for day in and day out. A name on the opposite end of that spectrum is Mikhail Grabovski, other than fans of the teams he has played for, he is not too well known. However, during the '10-'11 season Grabovski took a step towards becoming a more well known name around the league. After he set career highs in all of his major statistical categories with 29 goals, 29 assists, 58 total points, in 81 games played. 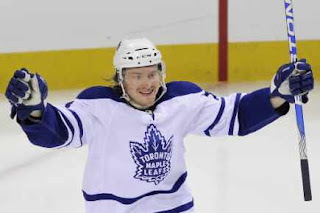 He has steadily developed into one of the Toronto Maple Leafs' top offensive threats, finishing the season ranked third in points. Behind only Clarke MacArthur and Phil Kessel. Adding to his stats last season, Grabovski turned out one of the best shootout goals of all time when he beat St. Louis Blues' goaltender, Ty Conklin. Grabovski tweaked a goal that often beats goaltenders anyways. Coming down to the left of Conklin, Grabovski cut across the crease where he pulled a 360. This is where most players would jam the puck home as the goalie scrambles, not Grabovski. He completed the 360, came out on the other side of the net and chipped the puck over a helpless Conklin. Grabovski said in an interview after the game that his dad was in the stands that game and he wanted to give him a little something. I'm sure his dad was proud of that one.